New #5 type set follower Mariner1 does just what you might guess, collect lots and lots of Seattle Mariner cards. He's got (almost?) every regular and traded card from 1977 to 2010, a total of over 1000. His Emerald City Diamond Gems blog just started in Feb, but already touched on two subjects close to my heart: Retro Mariners and the 1980 Topps set. 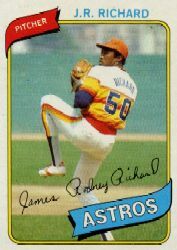 Don't remember if I started in 1979 or 1980 myself, but that J. R. Richard card stirs up some good memories. Here's a classy throwback from Seattle's early days. See more of Mariner1's collection at Emerald City Diamond Gems. Thanks for the praise. I hope to be as good as some of you on the blogs someday. It's nice to know people read my stuff. Thanks again!